Talmudist and rabbi of several large communities; born at Posen about 1550; died Nov. 12, 1631, at Prague. His father was either rabbi or, at least, an eminent Talmudic authority in Posen; and his father-in-law was Solomon b. Jehiel Luria, whom he succeeded, after the latter's death, in the rabbinate of Lublin (1578-84). Before this, however, he had officiated as rabbi of the communities of Turbin and Lubomil, Poland. At Lublin he had a bitter quarrel with the celebrated Talmudist of that town, Meïr b. Gedaliah (Maharam). The latter apparently had at this time no official appointment at Lublin, but was the leader of one of the largest yeshibot; and by virtue of his great Talmudic authority, he had it in his power to make it very unpleasant for the rabbi of his community. Although the two men had been friends before Auerbach entered upon his office (compare MaHa-Ram, Responsum No. 27), this relation was disturbed when Auerbach, as rabbi of the community, became the superior of MaHaRam. In addition there was an ancient feud between Luria and Maharam's father, which passed over to their sons. 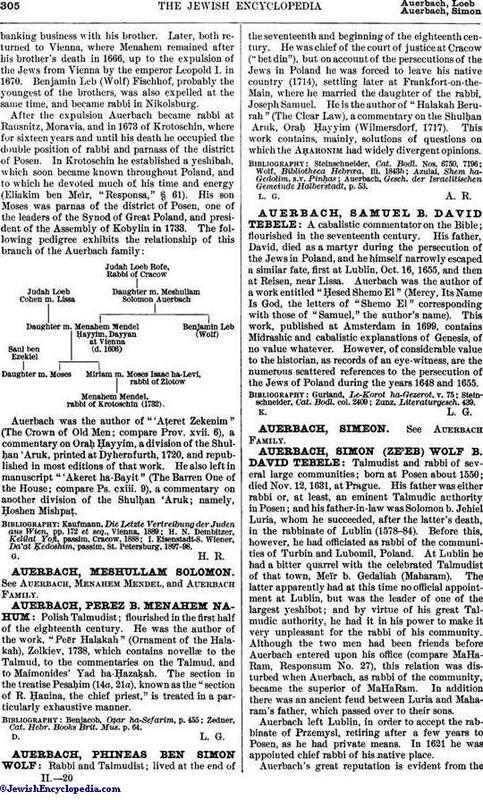 Auerbach left Lublin, in order to accept the rabbinate of Przemysl, retiring after a few years to Posen, as he had private means. In 1621 he was appointed chief rabbi of his native place. 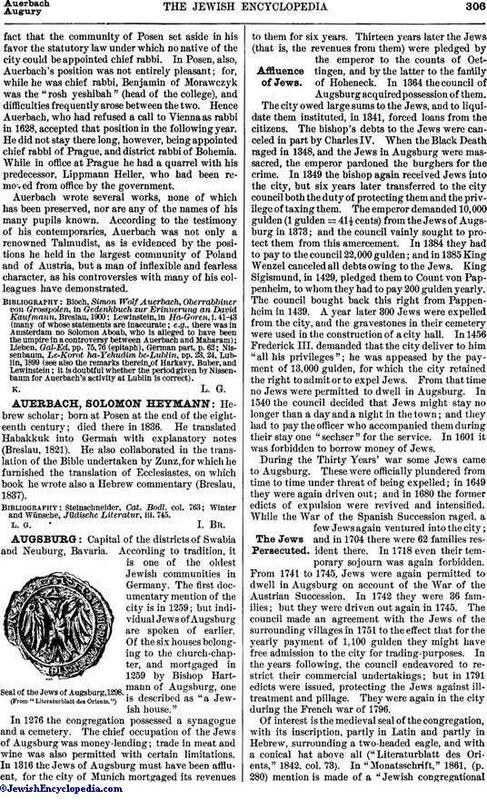 Auerbach's great reputation is evident from thefact that the community of Posen set aside in his favor the statutory law under which no native of the city could be appointed chief rabbi. In Posen, also, Auerbach's position was not entirely pleasant; for, while he was chief rabbi, Benjamin of Morawczyk was the "rosh yeshibah" (head of the college), and difficulties frequently arose between the two. Hence Auerbach, who had refused a call to Vienna as rabbi in 1628, accepted that position in the following year. He did not stay there long, however, being appointed chief rabbi of Prague, and district rabbi of Bohemia. While in office at Prague he had a quarrel with his predecessor, Lippmann Heller, who had been removed from office by the government. Auerbach wrote several works, none of which has been preserved, nor are any of the names of his many pupils known. According to the testimony of his contemporaries, Auerbach was not only a renowned Talmudist, as is evidenced by the positions he held in the largest community of Poland and of Austria, but a man of inflexible and fearless character, as his controversies with many of his colleagues have demonstrated. Nissenbaum, Le-Korot ha-Yehudim be-Lublin, pp. 23, 24, Lublin, 1899 (see also the remarks therein of Harkavy, Buber, and Lewinstein; it is doubtful whether the period given by Nissenbaum for Auerbach's activity at Lublin is correct).